You are considered a freshman (first-year university student) if you have completed your secondary education and earned a certificate of completion that enables you to be admitted to a university in your home country and is equivalent to a U.S. High School Diploma and have never been enrolled full-time as a college or university student. If you have enrolled as a full-time college or university student, you will need to apply as a transfer student. For international students to be considered for admission to UC San Diego, you must meet specific English proficiency requirements. If you are a transfer applicant, you can fulfill the requirement with grades of “B” or better in your two required transferable courses in English composition. All other applicants must fulfill the requirement with an exam. Report your scores to the undergraduate admissions office before January. Achieve grades of B or better in the required UC-transferable English composition courses. Submit a TOEFL score of 83 or higher (internet-based test). Submit an IELTS examination with a 7 or better band score (academic module). TOEFL and IELTS exams must be completed no more than two years prior to transfer. Report all completed coursework as it appears on your academic records at each institution. 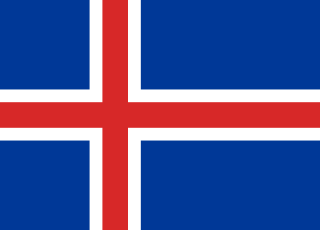 The application will analyze your scores using your country's grading standards. Do NOT convert scores yourself or have them converted professionally. Be sure to include explanations if grades do not fit in the given space and are abbreviated. To be considered for admission, you must have completed secondary school with a superior average in academic subjects and have earned a certificate of completion that enables you to be admitted to a university in your home country and is equivalent to a U.S. high school diploma. Use the dropdown selector to identify the names of certificates, diplomas and other documents that are the equivalent of a U.S. high school diploma. In addition to these international secondary school completion requirements, keep in mind that admission to UC San Diego is competitive. You must achieve excellent results on your final secondary school exams. You must take all tests by December of the year before you plan to enroll. 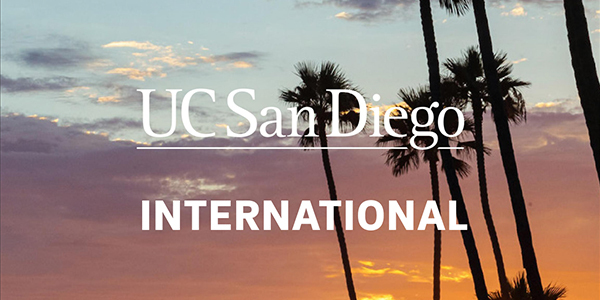 Make arrangements with the Educational Testing Service to take these tests in your home country and request that your scores be sent directly to the UC San Diego Undergraduate Admissions Office. This information is meant to supplement the general eligibility requirements for freshmen, not to replace them. Your international school must have an appropriate level of recognition in the educational system it follows. You must also be earning a certificate of completion that will allow you to enter a university in that educational system. If your international school follows a U.S. curriculum, your school must have U.S. accreditation and you must graduate with a U.S. high school diploma or an equivalent credential. If you are completing your IB diploma or simply taking IB courses, make sure to report your IB status in your application. There are instructions in the application for reporting IB coursework and examinations. If pre-university education is 13 years long in your country, you must complete all 13 years before entering UC San Diego. You must graduate from secondary school in your country, earning a certificate of completion that enables you to attend a university in your country. 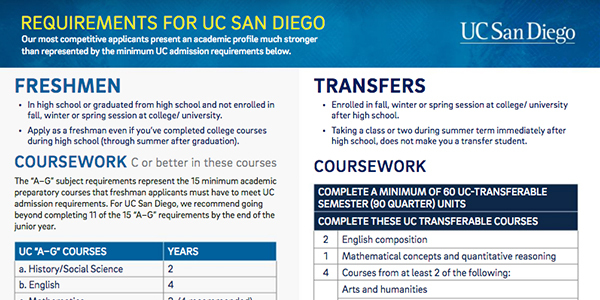 Admission to UC San Diego is not offered prior to completion of the 13th year. You must complete at least 5 IGCSE/GCSE/GCE O Levels and at least 3 GCE A Levels to be considered for admission. If you receive "A", "B" or "C" grades on your GCE A level examinations, UC San Diego may consider granting you transfer credit toward your bachelor’s degree. The exact credit amount will be determined after you have been formally admitted and provide your official certificate. You must complete 12 years of education and receive your certificate of graduation (i.e., Red Book). All grade 12 subjects must be completed, passed with a C result or better, with an overall 3.0 (or equivalent). We do require grade 9 transcripts, including if it was completed at a middle school. Students in an A Level program should refer to the British entry above. You must complete your standard XII years of education and sit for 10th and 12th year board/state examinations. You must complete your SPM and STPM or A Levels to be considered for admission. You must complete Sri Lankan O and A Levels. You may also complete O and A Levels through a British Examination Authority. To be granted a visa, international students must prove sufficient funds to meet all expenses for studying in the U.S. This financial independence requirement makes it extremely difficult for most undergraduate students whose parents are not California residents to qualify for classification as a resident for tuition purposes at the University of California. This includes students from community colleges and other post-secondary institutions within California. Read more about Residency for Tuition Purposes. Your admission to UC San Diego is provisional pending the receipt and review of your official transcripts, records and exam results. If any of your high school or college education occurred outside the United States, you must submit required records, transcripts, International Baccalaureate certification, or other documents to UC San Diego. The information below is for newly admitted freshman students who attended a school outside of the United States. Admitted transfer students who attended high school outside of the United States are not required to send their official high school documents. The country-specific information below may be in addition to the items listed on your Triton Checklist. The deadlines for UC San Diego to receive your documents are July 1 for transcripts and July 15 for IB test scores. If you are a prospective student who is planning to apply or recently applied, view the U.S. High School Diploma Equivalents on this page. All international transcripts (beginning from grade 9) must be submitted – even if your current school lists them. Include grade 9 middle school records and any grades you may have repeated when studying in the United States. Full transcripts indicating internal marks from your secondary school (grades 9–12) must be submitted on or before the July 1 deadline. All courses in your final year must be passed with a C result (or equivalent) or better, with an overall 3.0 grade point average (or equivalent). Ask that your school authority provide predicted results, if possible, together with an explanation of when your final marks and certificate will be available. You must contact IBO directly to request that IB certificates or diplomas be sent electronically to UC San Diego. The deadline to receive your results is July 15. By July 1 – your school must send official copies of your GCSE/IGCSE Statement of Results, AS Level Statement of Results (if applicable), and all internal marks (when available). A Level Statement of Results must be submitted as soon as they are available. 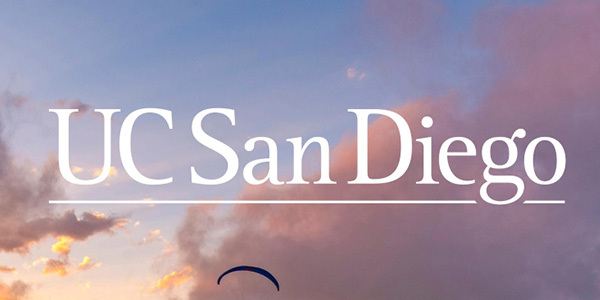 You must pass at least 3 A Level exams with a C result or better to finalize your UC San Diego admission. Official A Level results must be sent directly from the examining authority (Cambridge, OCR, Edexel etc) in the form of the “Certifying Statement of Results” after A Level Certificates are released. Advanced standing credit for A Level exams will only be posted to your record upon receipt of the official document. What Documents Are Required By Country? To find out what documents must be submitted to UC San Diego, locate the country or region where your education took place. Internal school marks (grades 9-12) and State/Territorial Year 12 certificate including external exam results. Attested copies of your SSC and HSC (including marksheets) sent directly from the schools of attendance. Copies sent by any other method will not be considered official. Certificado de Conclusão do Ensino Médio (certificate of secondary school completion/diploma) issued by the Colegio or Ministério da Educação and Histórico Escolar (academic transcripts) issued by the institution attended. Your admission will only be cleared upon receipt of the provincial or territorial Ministry of Education (MOE) secondary school record and diploma. You may submit your internal school transcripts until the MOE record is available. The MOE transcript must indicate that you earned the provincial/territorial diploma. All grade 12 classes must be passed with a C result or better, with an overall 3.0 (or equivalent). Original records in English from middle school and high school – grades 9-12. All grade 12 subjects must be completed and you must earn and submit your Certificate of Graduation. All grade 12 classes must be passed with a C result or better, with an overall 3.0 (or equivalent). All transcripts must be sent directly from the school to UCSD or via Parchment. 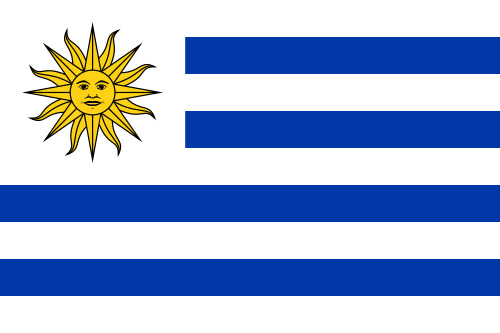 Notarized translation booklets will not be accepted. If you also completed an A level program at your school, see the UK entry. Upper Middle School record (grades 10-12) – this record must be cumulative; partial incomplete documents with addendums/additions will not be accepted. Clear, legible photocopy of graduation certificate or diploma issued by Ministerio de Educación Pública (Bachiller en Educación Media, Técnico Medio, Diploma de Conclusión de Estudios de Educación Diversificada) and Certificado de Notas/Calificaciones (academic transcripts) issued by the institution attended sent directly to UC San Diego. Clear, legible photocopies of official Diplôme du Baccalauréat and Relevé de Notes de l’Examen Final (academic transcript) issued in French showing all subjects taken and grades obtained certified by the French government, either by a local municipality or an overseas French Embassy/Consulate [photocopie certifiée conforme par le gouvernement Français (soit par votre Mairie soit par un Ambassade/Consulat)]. Zeugnis der Allgemeinen Hochschulreife or Abitur sent directly from institution attended. Apolyti Lykeiou (School Leaving Certificate) indicating all exams taken and grades obtained sent directly to UCSD from school attended. Old system: HKCEE & HKALE results sent directly from testing authority. You must sit for and pass at least 3 A level exams with C results or better Advanced standing credit for A Level exams will only be posted to your record upon receipt of this document. New system: Official HKDSE Certificate and senior secondary academic transcripts issued by the school. Attested copies of the Statement of Marks for the STD X and XII Board exams (SSC, AISC, ISCE, HSC, HSSC, AISSC etc.) sent directly from the schools of attendance. Copies sent by any other method will not be considered as official. Surat Tanda Tanat Belajar (STTB) or Sekolah Menengah Unum Tingkat Atas (SMA) certified true/attested copy sent from school. Examination results for the Teudat Bagrut (matriculation certificates) issued by the institution attended. Diploma di Maturita and Pagelle Scolastiche (academic transcripts) for all years of secondary study – issued by the institution attended. Original records in English from middle school and high school – grades 9-12 including certification of graduation. All grade 12 classes must be passed with a C result or better, with an overall 3.0 (or equivalent). All transcripts must be sent directly from the school to UCSD or via Parchment. Examination results for the General Secondary Education Certificate issued in English and sent directly to UCSD from the appropriate Regional Office of the Ministry of Education – not from a third-party agency or family member. All examination results issued by the appropriate examining body (e.g. Sijil Pelajaran Malaysia (SPM), Sijil Tinggi Persekolahan Malaysia (STPM), Unified Examination Certificate (UEC)). Full completion of the entire 13 year secondary education program is required. If you completed an A level program at your school, see the UK entry. Academic transcripts/records for grades 9-12 and Certificado de Educacion Secundaria + Certificado de Bachillerato sent directly from the schools attended. External examination results for the Universities Entrance, Bursaries and Scholarships Examination or National Certificate sent directly by the New Zealand Qualifications Authority. Graduation certificate (Vitnemål fra den Videregående Skolen) issued in English, indicating all exams taken and grades obtained sent directly by the school. Please note that the University of California does not grant advanced standing credit for the secondary diploma. Certificate of Examination (SSC & HSC) issued by the Board of Intermediate and Secondary Education and the corresponding Mark sheet/result card sent directly to UCSD from the Board and verified by the Controller of Examinations. Graduation Certificate (Swiadectwo Ukonczenia) indicating all exams taken and grades obtained sent directly to UCSD from school attended. Intermediate School Certificate + General Secondary Education Certificate (Tawjihiyah) sent directly to UCSD from the appropriate Regional Office of the Ministry of Education – not from a third-party agency, school or family. O level and A level Certificates sent directly by Singapore MOE. You must sit for and pass at least 3 A level exams with C results or better. Advanced standing credit for A Level (H2) exams will only be posted to your record upon receipt of the official A level results from the Singapore MOE. Graduation certificate (Título de Bachiller) showing all exams taken and grades obtained, sent directly from school attended. External examination results for the General Certificate of Education, O-Level and A-Level sent directly from the department of examinations. No advanced standing credit is allowed for Sri Lankan A Level exams. Graduation certificate or diploma issued in English (Avgångbetyg från Gymnasiet, Slutbetyg från Gymnasiet, Teknikerexamen) showing all exams taken and grades obtained, sent directly from school attended. Graduation certificate (Maturitätszeugnis/Certificat de Maturité/Attestato di Maturita) showing all exams taken and grades obtained sent directly from school attended. Original records in English from middle school and high school – grades 9-12 including date of graduation. All grade 12 classes must be passed with a C result (or equivalent) or better, with an overall 3.0 (or equivalent). All transcripts must be sent directly from the school to UCSD or via Parchment. Academic transcripts and Matayom Suksa VI (Certificate of Upper Secondary Education) issued in English and sent directly by the school. Clear, legible photocopy of Graduation certificate issued by the Ministry of National Education (e.g. Lise Diplomasi, Meslek Lise Diplomasi) and academic transcript issued by the school. Examination results for the General Certificate of Secondary Education issued in English – sent directly to UCSD from the appropriate Regional Office of the Ministry of Education – not from a third-party agency or family. By July 1 – original or school-certified copies of GCSE/IGCSE certificate(s), AS Level certificate(s) (if applicable), and all internal marks (forms 4,5,6). A Level Statement of Results must be submitted as soon as provisional results are available. You must pass at least 3 A Level exams with a C result or better to finalize your UCSD admission. Official A Level results must be sent directly from examining authority (Cambridge, OCR, Pearson Edexcel, etc.) in the form of the “Certifying Statement of Results” in the Autumn after A Level Certificates are released. Advanced standing credit for A Level exams will only be posted to your record upon receipt of this document. Academic transcripts (years 9-12) issued in English or exact word for word official translations and Examination Results (Ðiểm Kỳ Thi Tốt Nghiệp THPT) for the High School Graduation Examination (Kỳ thi tốt nghiệp trung học phổ thông THPT) sent directly from the school attended.